They Swim! They Glow! Meet Our New GloFish! So, when our Tetra Size 3 GloFish tank kit arrived, I put my daughter to work to put it all together; she loves doing that kind of thing. We had our fish already, and we followed the instructions almost perfectly to acclimate the four little guys to their new environment. We were a bit worried that we didn't do everything the instructions asked; it required us to float the bag full of fish in the tank to get their water to the right temp gradually. Unfortunately, the bag was so big (it was full of air) that it wouldn't even fit inside the top of our small tank. So we dumped the fish into a clean bowl and let them acclimate by adding cups of the tank water a bit at a time until the waters were similar temp. Then, we scooped them with the included net and put them into their new home. We didn't turn on the lights right away. We received a bunch of really cool accessories, including a Tetra Wonderland Collection Color-Changing Mushroom that glows different rainbow colors and responds to the overhead "blue" light. We didn't want to freak out the fish, so we let them chill in the tank for about 8 hours before turning on the "psychedelic" experience. Wow, was it bright! Between the special accessories we put in the tank, the overhead lights, and the fish themselves, it was quite the colorful look. My daughter thought it looked cool, but asked right away if it was OK to turn the lights off when she went to bed (the fish are in her room.) Of course, this was alright with me. The kids are learning a lot about fish, and we look forward to incorporating this type of learning into our homeschool lessons. 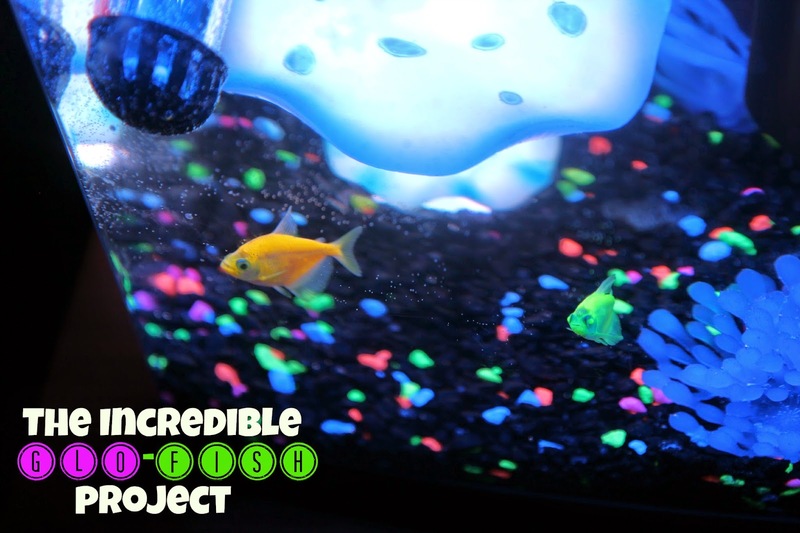 We are also taking the history of how the GloFish have come about as an opportunity to learn about the special way that science can be used to help creatures adapt and teach scientists about dangers in our environment. The geek in me really, really likes these fish! You can get everything you need for your GloFish tank at your local Walmart, in their pet section. You'll want to stock up on food, a thermometer, water conditioner, a heater, and a filter pump, if they don't already come in your choice of aquarium starter kit. You can also find quite the variety of Tetra fish products and those specifically for the GloFish breeds online.